In a time before man became civilized some battles were too costly. Civility had begun to make its way into the minds of the leaders of the clans. In the darkness of a cave resides the old wizard, mystic, master of fire and shaper of iron. He has developed a new tool to develop the strategic thinking. 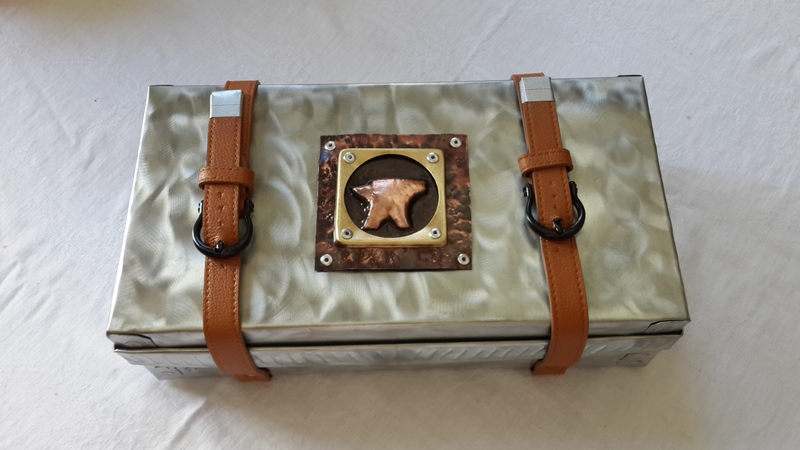 Here one is made, reminiscent of days of old and yet somehow a reminder that all that was still is. I made this for my friend. The idea came to me, and probably had seen one before, when I was looking at some Medieval stuff for a book that I was, might still do later on. Since my friend lives in Germany it just clicked in my mind. There are some leaps to connect these dots for sure. Hahaha. Miniatures are a bit of a PIA to make. I deviated a little in design and they all fit on a 3.5cm square. 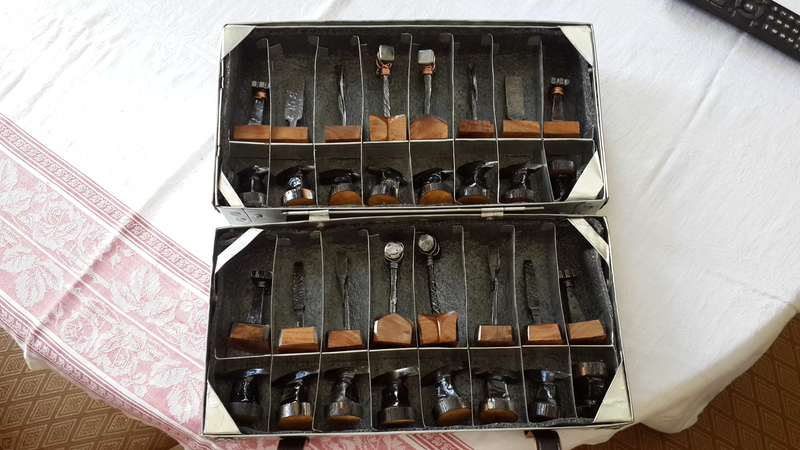 The Pawns are 2 different style anvils, one an English style, the other European style. The European style fit on the diagonal as they kept coming out slightly longer. I think I was having too much fun making them and the size was small enough, but easy enough to make, so I just kept making them. 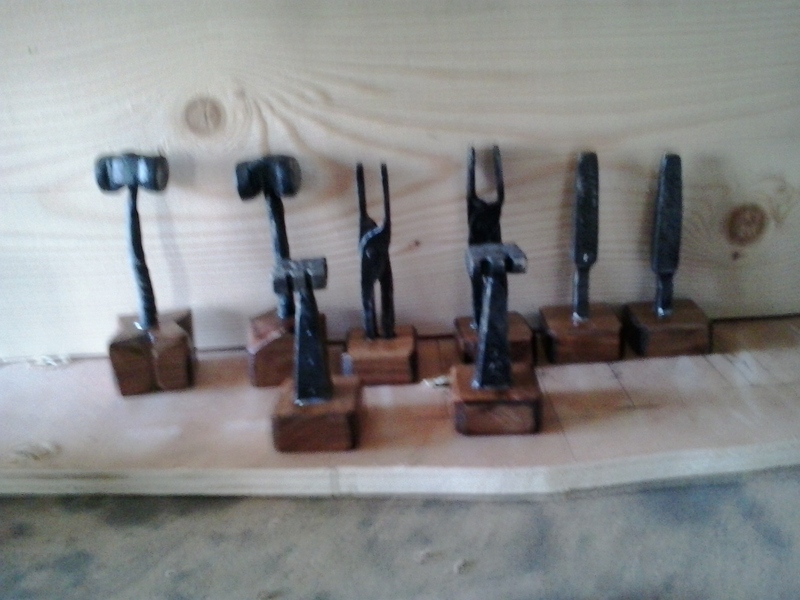 Yes I could have filed them down to size and I did clean all the pieces up in a few spots, but I wanted them to be off the anvil as much as possible. Why? It is what I wanted. The Kings are about 12 cm tall, Queens about 11.5 cm, Bishops 11 cm, Knights 10.5, Rooks 8 and the Pawns about 5 cm tall. Pretty much straight forging. 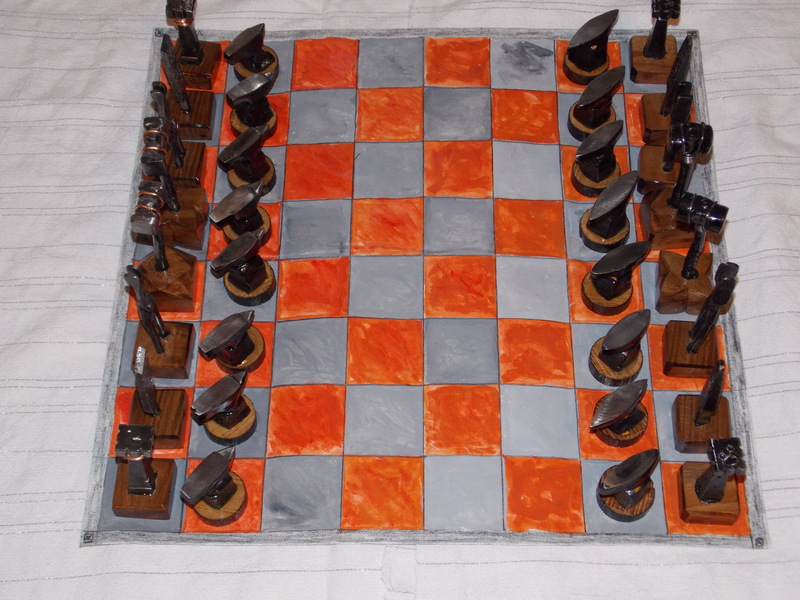 I started with the Pawns (anvils), then the King and Queens (hammers) and moved down the line. The Bishops are Tongs as we all know the Francis Whitaker’s quote, “If you cannot hold it, you cannot work it” and so rightly belong in the hierarchy of tools. The knights (files) were originally going to have a punch and chisel with them, but that was a lot to fit on that base so I set the punch and chisel aside. The Rooks were a challenge, what could represent them. Ahh, ha! A Swage Block upon an obelisk would do the trick. The process was pretty much the same this time around. This one I made in the new charcoal forge I made and it worked out very well. I made the members of the cross out of flat, twisted them and then flattened them back out again. I counter sunk and chiseled the hole for the rivet, which was a 4mm bolt with the head rounded over, cold, and then cut and hammered into place cold. 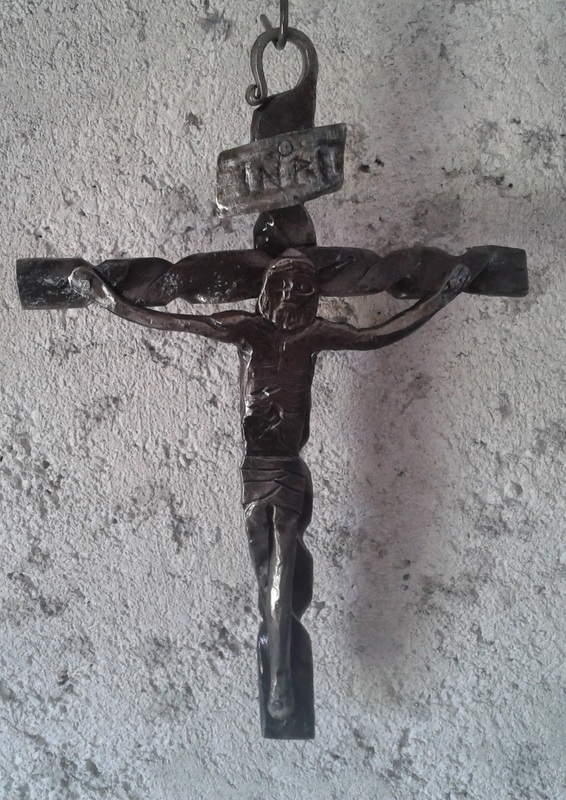 Overall length of the cross is about 24 CM and 16 wide. 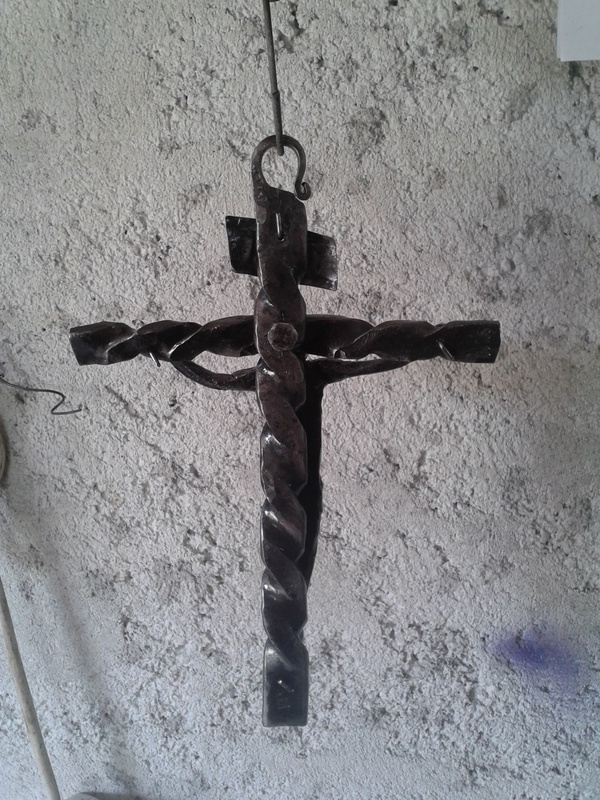 I used a piece of galvanized for the INRI banner on top. I have an abundance of small pcs with nothing to do. I guess the real big difference here was that I actually took the time to make new chisels – I used re-bar like I have hundreds of times in the past, but here the re-bar appears to be to soft. This is the first time I have ever been disappointed by a re-bar tool. In this case it was all three chisels. I think they started to mushroom out before the hammer hit them. Hahaha. Oh well. I finished the body of Christ up with my other chisels and will be making all my new chisels out of the either leaf spring or some breaker bar I have, but that is some big stuff to reduce for smaller sized chisels like I need. 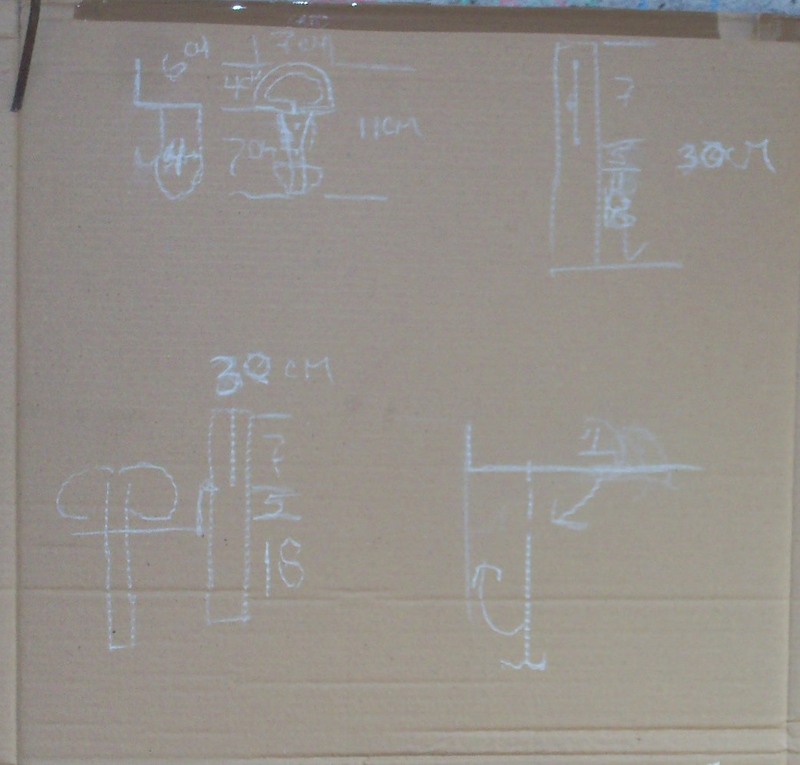 The process went something like this – 4cm x 5mm thick x about 30 cm long. Mark out and cut arms, legs, head. Shape head first, then spread and shape arms. Mark the beard line and chisel and lift a little. A little fullering under the beard line will make it stand out more. Use chisel and punch to put eyes, nose and mouth on face. On the head and chest cavity you want to round it up on a stake tool to give it a more natural appearance. Flat will work, but rounding it gives a little better look. Eyes should be about in the center of the face, mouth 2/3 from top and the nose between. This is using standard drawing sizing. Ears which are not an issue here, should be from the corner of the mouth to the outside corner of the eyes. Bodies should be about 7.5 times the size of the head and average shoulders 2 times the head height. So a 2cm long head = a 15 cm long neck to foot plus 2 cm for head for a total of 17 cm with a shoulder width of about 4 CM. Arms width is equal to about the total height for the figure finger tip to finger tip. Just for reference if you ever need it. Okay back to the body, after I get the arms about right, I figure out the rib lines and fuller the stomach to give it a drawn in look and to define the chest cavity. I am concerned where the stomach section ends as I want to define the loincloth by having it raised a little from it. I add some fold lines and define where the legs enter the loincloth again fullering them a little to define them away from the cloth. Finish fullering the center of the legs I like to fuller it beyond the front on the backside, at an angle, so it gives a little better perception of depth for the legs. Finish rounding over the legs, slight indent for the knees and ankles, flatten feet a little, etc. These elements can be refined as much as you desire to. I wasn’t trying to make an exact replica of a body, but give the impression of one. 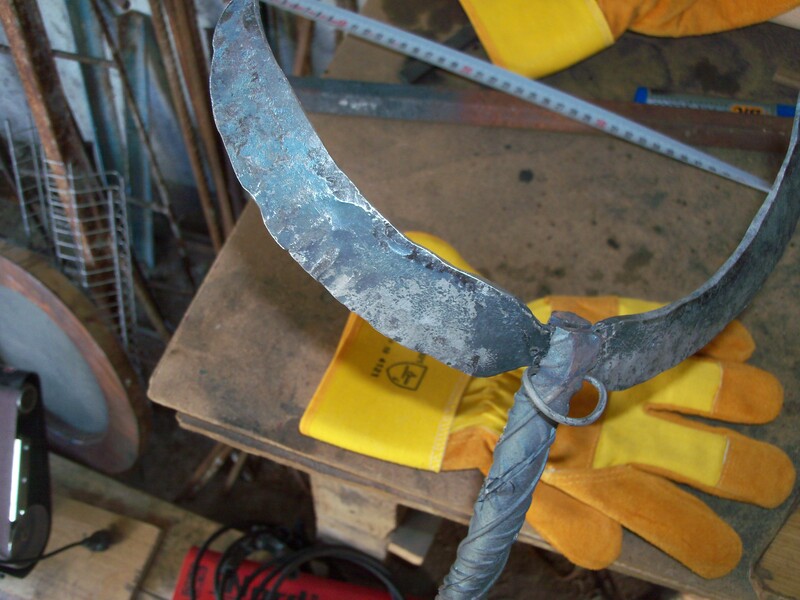 Now I pick the lowest visible rib and use a chisel to impart a spear wound. I am done. 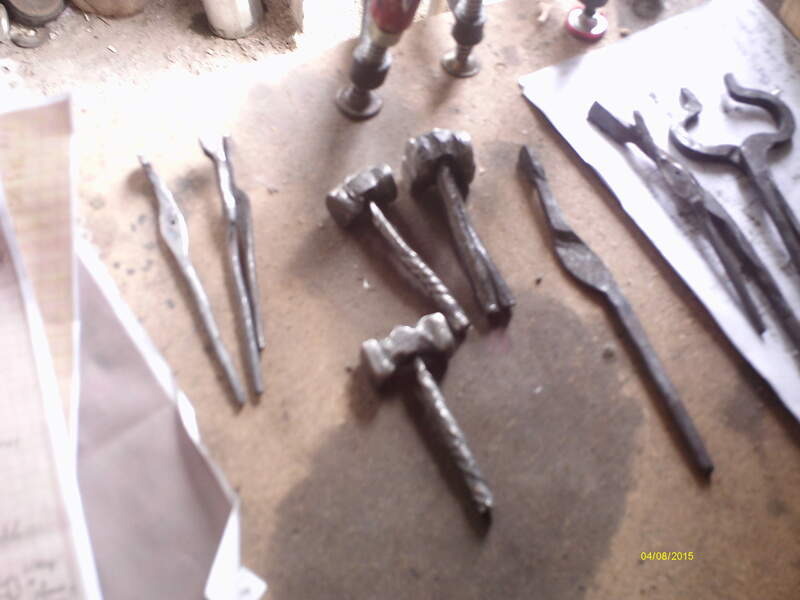 I use nails that I have squared up the heads a little and put them through the drilled holes in the hands and feet. I do the same for INRI placard. I trim the nails to length and bend over pulling them tight. I guess like anything else there are better ways to do this, but it holds the body very firmly from what I have seen so far and it isn’t seen hanging on the wall anyway. 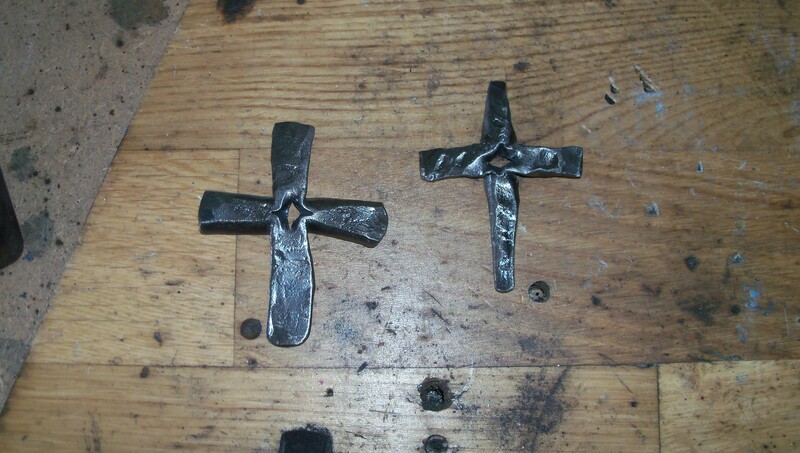 On a larger scaled crucifix you might want to actually forge some square and larger headed nails. Crucifix Back – nails look like they stick out but they don’t. Well hope you enjoyed the write up anyway. You know how it is sometimes when you are working, you just keep working and forget to take photos. At least I do. I am lucky I remember to put my touchmark on most things. I wound up putting it on cold. Oh well. I will do better next time, I will do better next time, I will do better next time. Hey I didn’t drift off to Kansas. hahaha. Til next time! See ya at the Forge!! 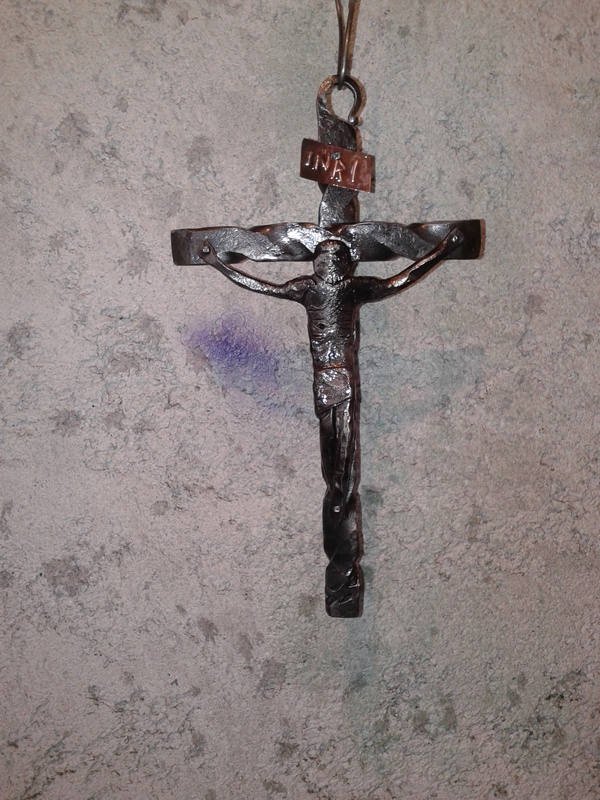 I moved on to a project that I started before I left for Italy: a crucifix. I smoothed out the texture I put in the bar I was using for the cross as I didn’t care for it. I decided to twist it and I liked that better so that is what I have. Next I took a 2 x 1/4″ pc and cut the lines of the arms and cut off the excess from the legs and head section. 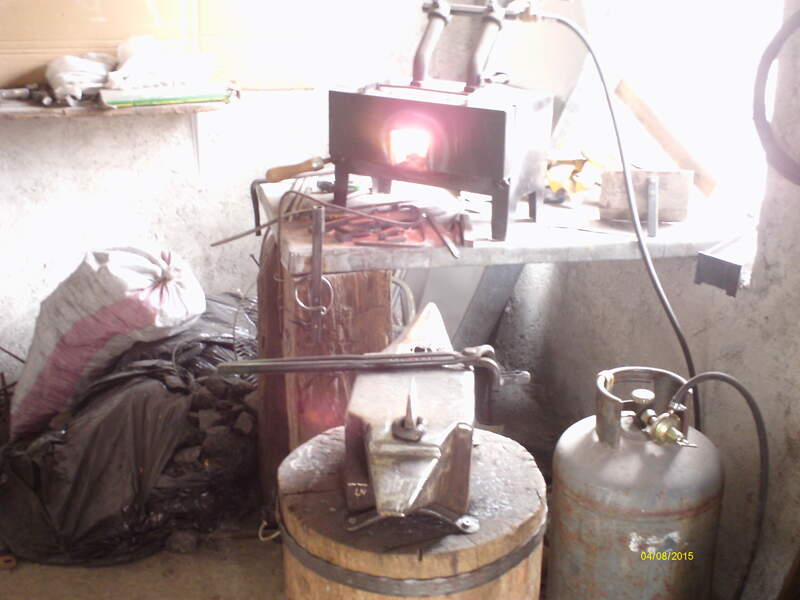 I left a stub on it to move it in and out of the gas forge easier. After shaping the head and arms somewhat I added some ribs and the spear wound. The idea was for the essence and not a detailed carving. After I was satisfied from the waist up I cut him off the stub and reduced the leg sections somewhat. I had to use a chisel and file for the close spots near the loin cloth. 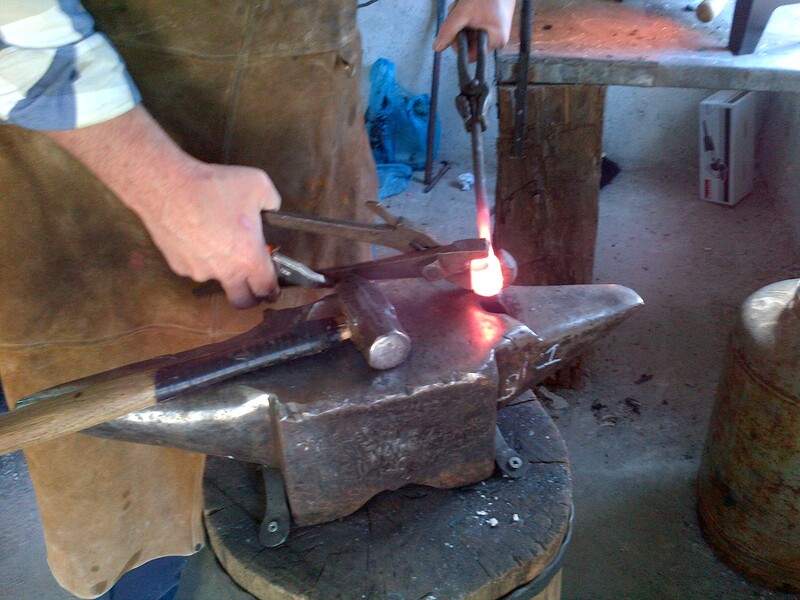 I don’t have a decent edge on the anvil, yet…. I will take a look at fixing that once I get my blower back and chimney set up. Pre-heat is a must with this much work. I rounded the legs up gave them a bend and something resembling feet. Viola the body is done. I originally heat colored it, but buffed most of that off. There is some on the loin clothe and a few smaller spots. It made the body almost disappear. I cut the pcs for the cross and lined them up for the body to be nailed to it. 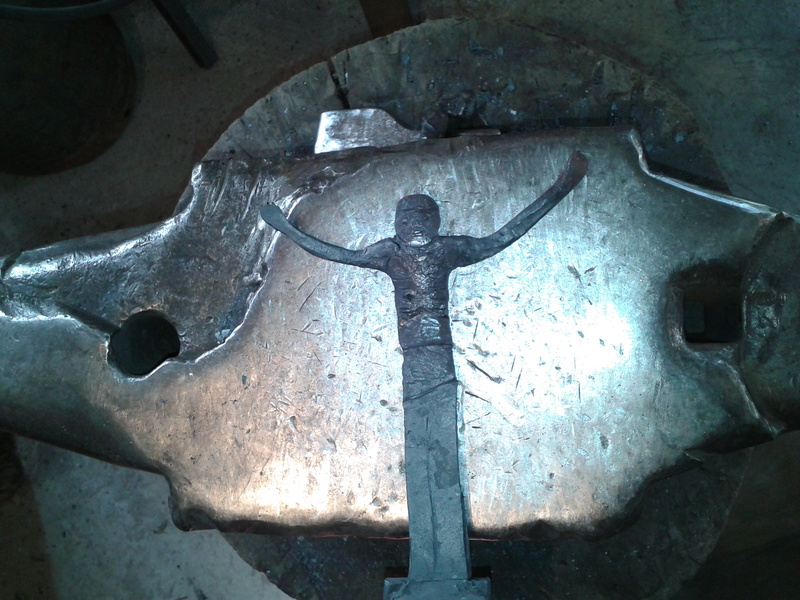 The cross itself is riveted together. 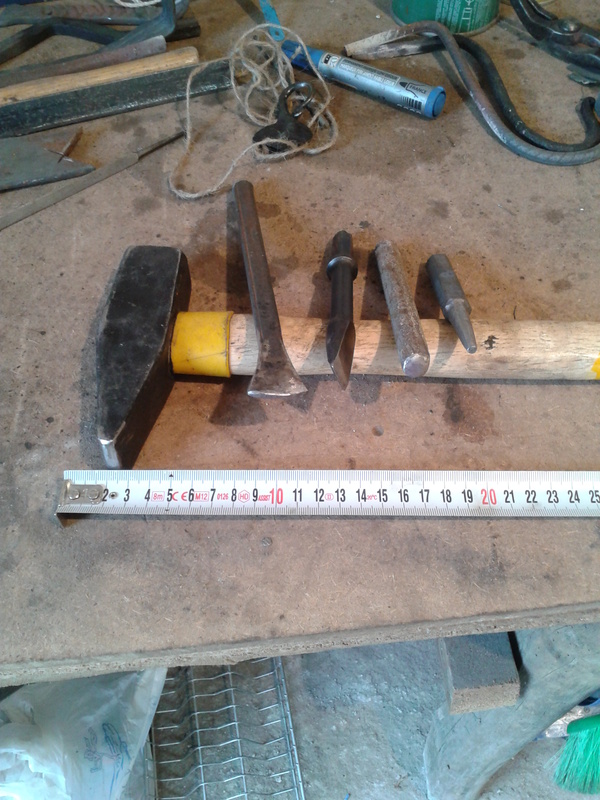 I used three flat head nails that I hammered into square heads, filed them off and bent them over on the back side. 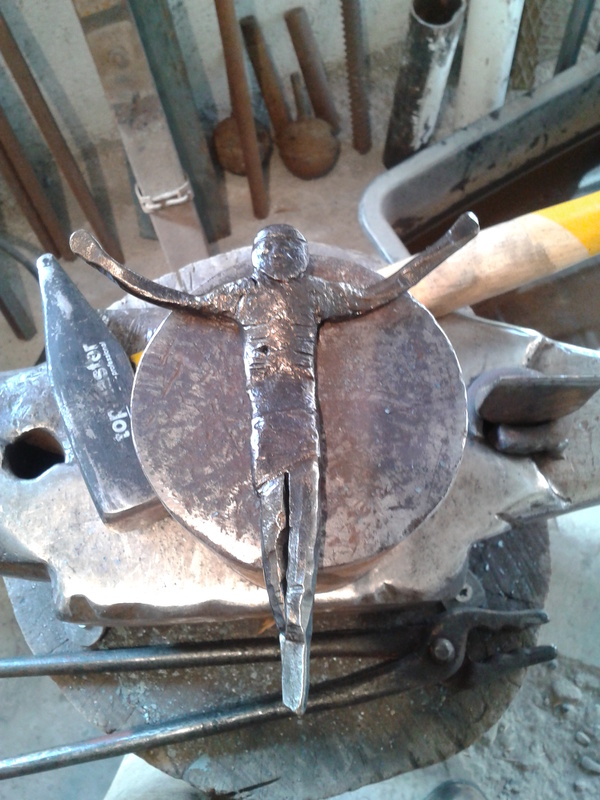 After I was done I found a small piece of copper in my repousse box and did a very rustic INRI and nailed that to the top. Since the riveting and nailing were done cold I sprayed each piece before to keep rust off for years to come. I have no idea what kind of coating it is. They were out of lacquer, but had a multi-surface transparent coating and while a little shinier than I like seems to have bonded well. This was a piece that I had wanted to make a few years ago and now found the time to do it. I used only a few basic tools this time around. I left out the file from the picture. If I make another I will make a smaller chisel, fuller and butcher to add better detailing and I will add a crown of thorns. But that isn’t until next time. I have other projects that I want to do before I return to this. As I had previously mentioned I had this thing with my ear clogging up which caused a severe case of vertigo, then the clogging came and went for about a month and a half. The Dr. who helped us out has helped my wife’s Aunt and Uncle on occasion and often doesn’t accept any payment even though she came to the house. Yes, I said came to the house, common here still. I decided that I would do something for everything that she has done for everyone. 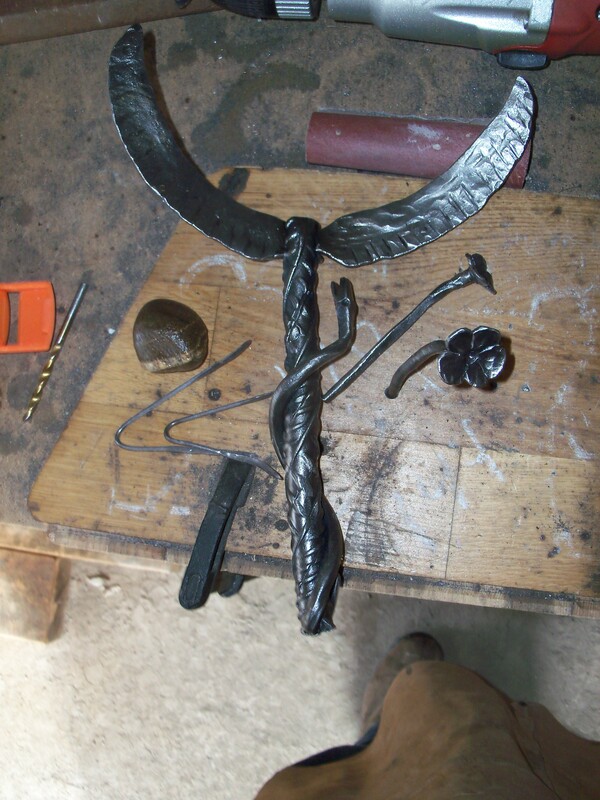 I started out to make a Caduceus. Simple enough, wings on a stick with two snakes, in the US Navy that is what we used. Well lo and behold, it is wrong to the rest of the world. The symbol for medicine for about 90% of practicing Medical Professionals in the world is the Rod of Asclepius. I guess I should have paid closer attention to Greek mythology, never gave it a second thought. Regardless, I was going to make something a little different anyway so I came up with a concept that included both. I think I like the idea contrary to the Greeks that the wings on the staff are a symbol of an Angel come to aid, the staff the necessary means by which to destroy the illness (the snake) befallen one. 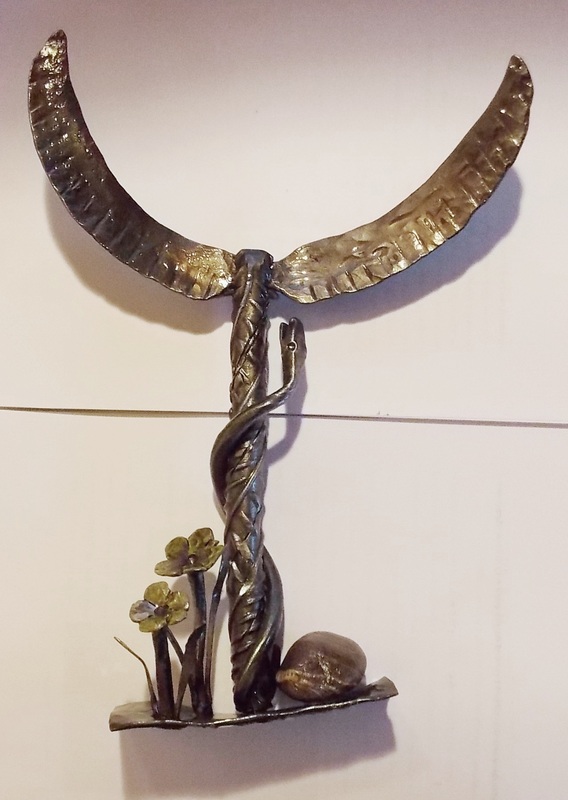 So I made a small wall hanging depicting the likeness of a scene on hillside using a non-traditional staff (I added wings) and singular snake of the Rod of Asclepius, add a few flowers to depict medicinal herbs and a rock for a snake to crawl out under from. There the scene is set. Below are a few pictures taken while making and the finished product. The wings are made from about a 6″ long x 5 mm thick x 2cm wide, the rod is 8″ long and 12mm in diameter. 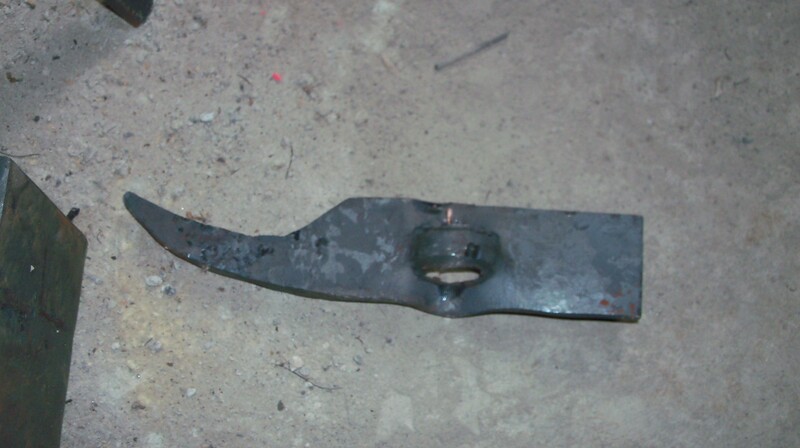 It is a piece of old rebar – I put a chisel line to break it up a little more and then twisted. I left the slight bends from twisting it in on purpose! Not everything I do is an accident. 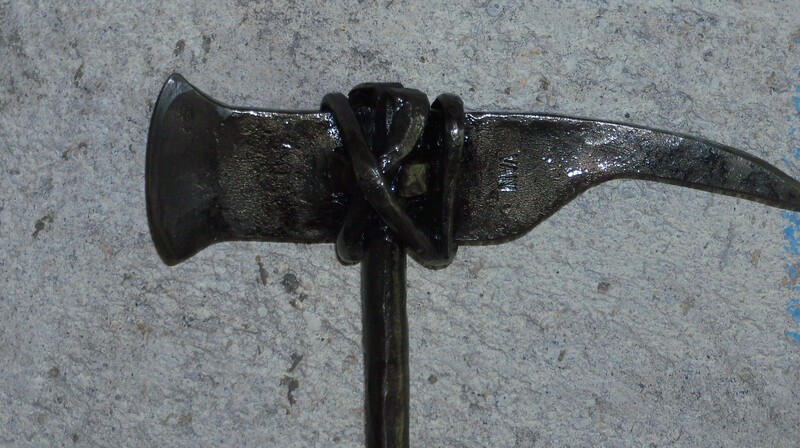 The Rod is split to receive the wings. I can get it nice and tight around the wings. I know because I forgot about the hanger at first, :). 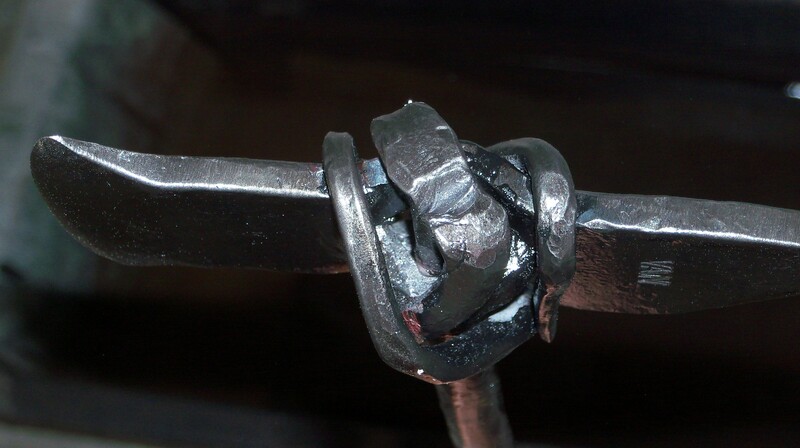 With the hanger in I had to resort to a very small tack weld to keep them from having a little wiggle. The shame of it all!!! 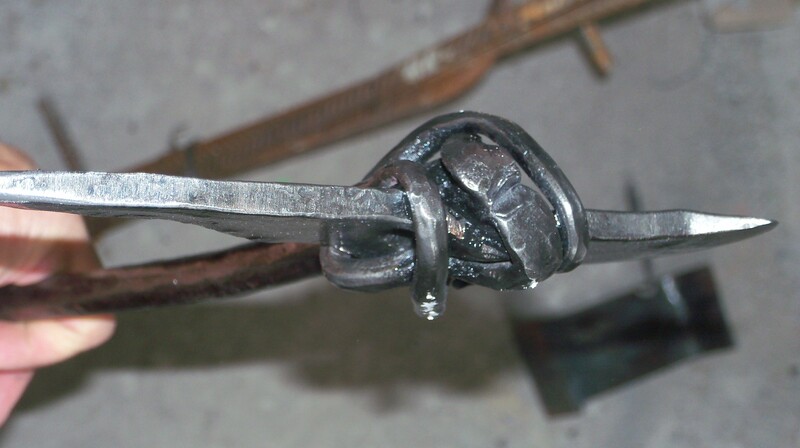 The bottom of the rod was split and the received the snake, the portion of the snake in the split is square and holds very tightly. 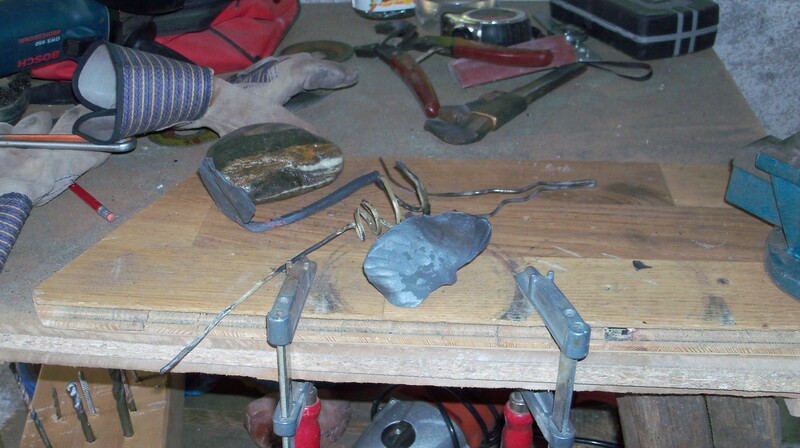 It will be post welded to the base plate of the flowers and rock so while it was nice to see I could get it nice and tight it will be welded over in the end. 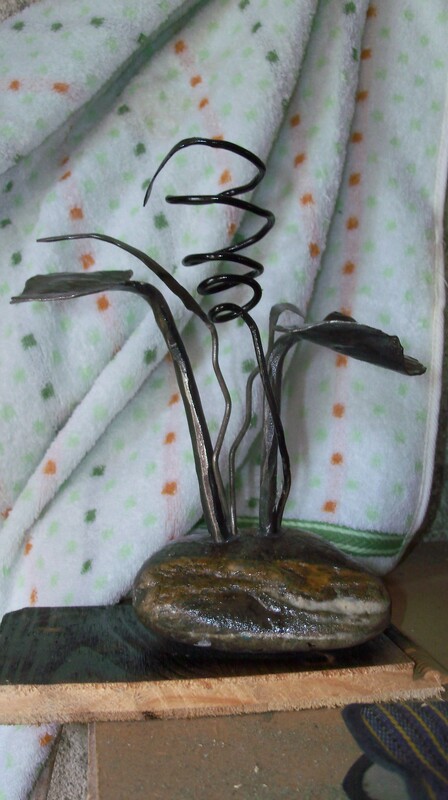 The flowers and rod have a hold in the base plate which they were all welded in place. Had I used a thicker base I would have used tenons, but it is heavy enough already. The yellow of the flowers shows up more in the picture than it does in person. I thought it gives it that B&W photo look with a splash of color and I still do. I could have used red, but I choose the yellow for a more muted effect. Let me know if that is the effect you felt from it. The Rock is epoxied on. There is an added benefit to using the rebar as it looks like stitches once cut and twisted it alluding even more to the Medical Profession. This was a fun project and of course I forgot to use my touchmark before I was done, I made a vain attempt to stamp it, but only the VA of VAN came out. I just couldn’t bring myself to give it a full force blow. I will remember to use my stamp one of these days. hahaha. I have a picture that will last as long as I do! hahaha. Oh if you want more info on Caduceus vs. Rod of Asclepius see Wikipedia for the full story. Yesterday I published my book ahead of schedule! Of course I very happy. 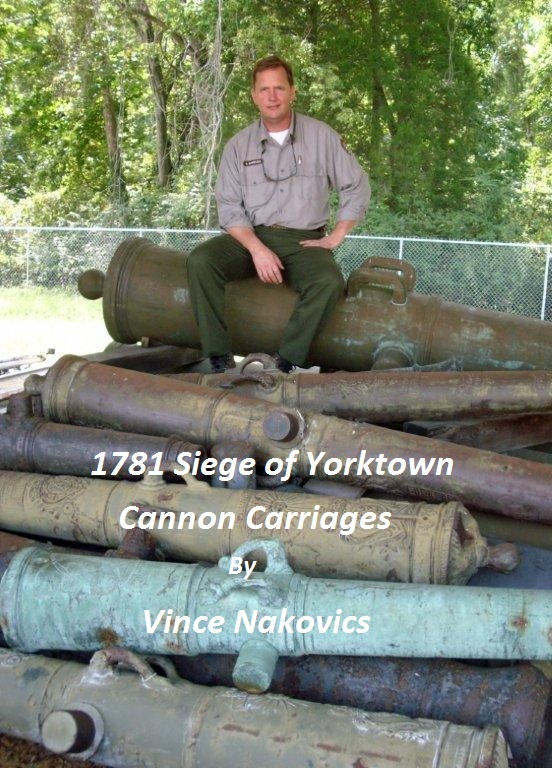 The book is about building Cannon Carriages which included the ironwork for me. We did it all over the 13 years I was at Colonial National Historical Park. 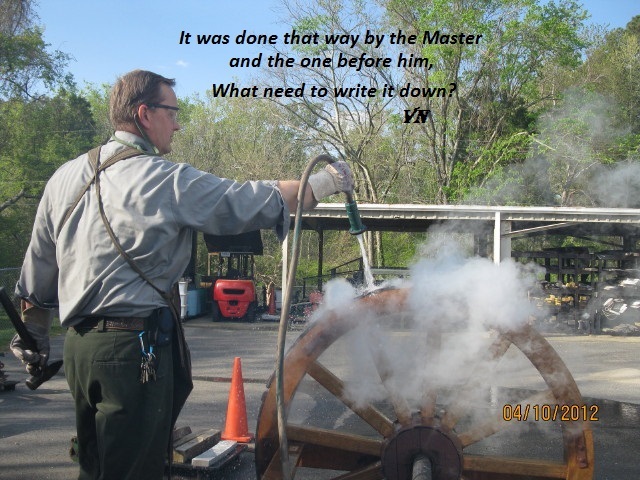 It was a great time and I hope to pass on the tricks and things I learned about making historic reproductions. 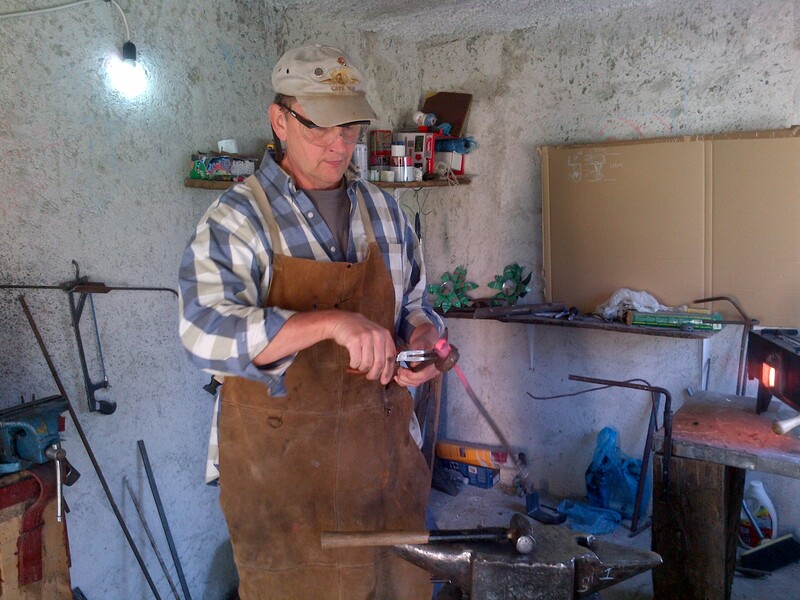 I am of the belief that those of us engaged in the old trades need to write down those skills and tricks or else they will be lost and some of them will never be rediscovered. History is in the details and many are lost everyday. So what have I been up to. Not much I have been busy attending to my much neglected book and I am happy with the progress on that front. I did manage to make a few smaller things of original design and discover that I managed to mess up my own design. Lesson learned again… pay attention to what you are doing. 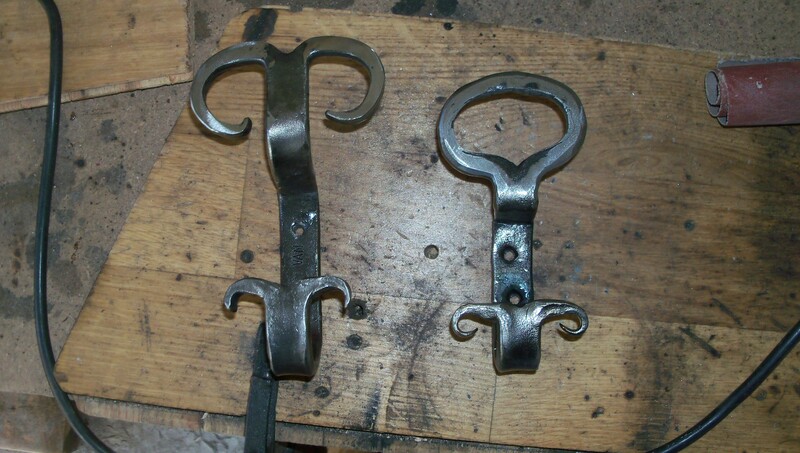 Both the coat hooks came out okay, but not the same length which is what I was after. For some reason I wrote down the wrong measurement on the second one! The shorter one is 11CM instead of the 18 CM on the body length. I needed that measurement to be the same for both. Oh well they are for me and now I have both processes down. These hooks keep you from getting those annoying pointy spots on the coats you hang up. Next up was a Fredrick’s Cross out of round bar. 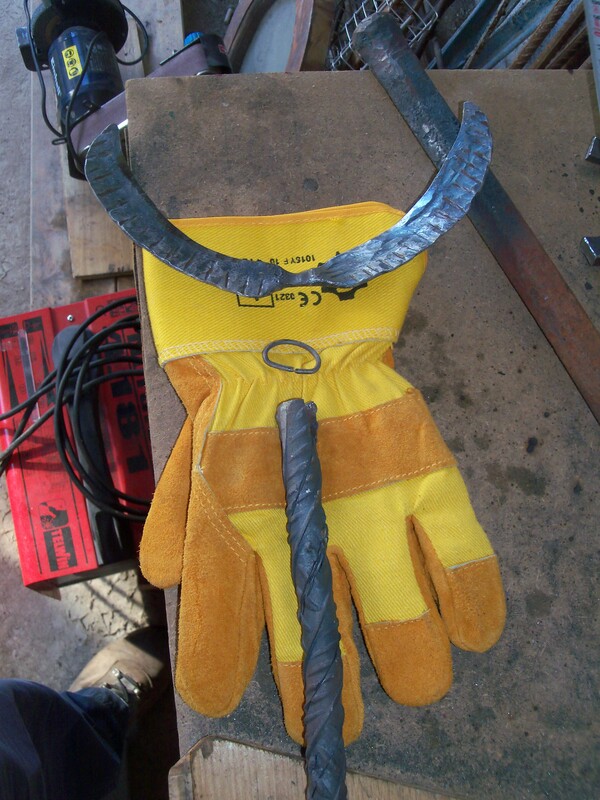 Came out okay and I just wanted to know that I could do the entire thing at the anvil. I had a nice chat with the ESAB region manager about product availability and possibly introduced him to a person that is interested in taking over this area to do provide quality welding equipment and accessories. That is sorely needed here. In a couple of years we will see if that happens. 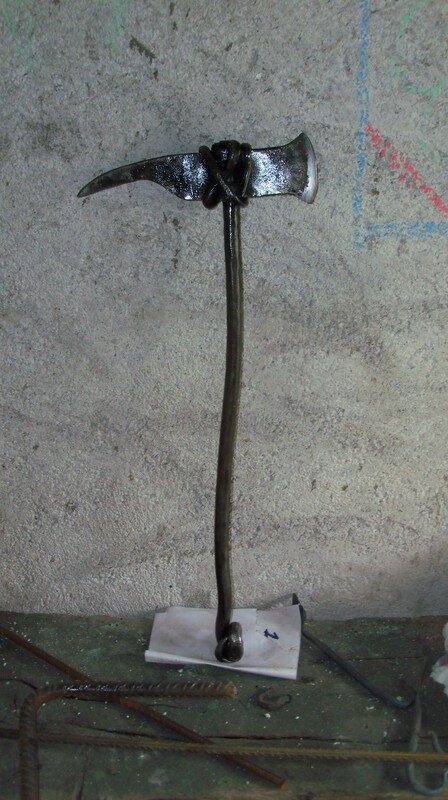 I also played around with making an axe with a wrapped head rather than a traditional drifted eye for a wooden handle. What did I learn, hmmm. I can do it all with hammer and anvil. 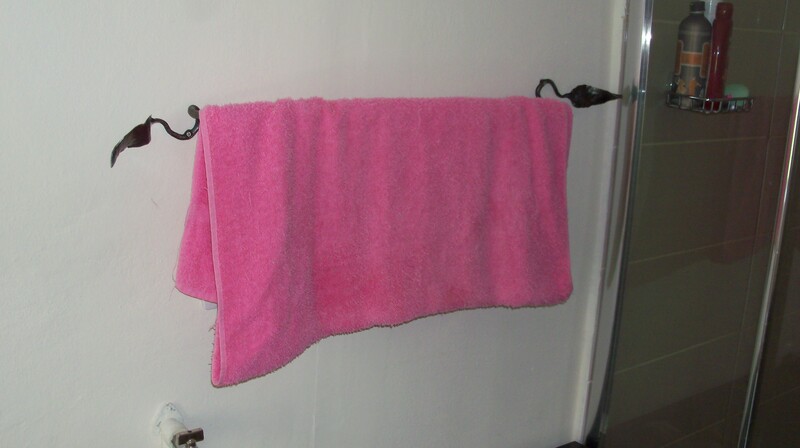 My wife wanted some hooks to hang her robe on in the bedroom and wala here it is. 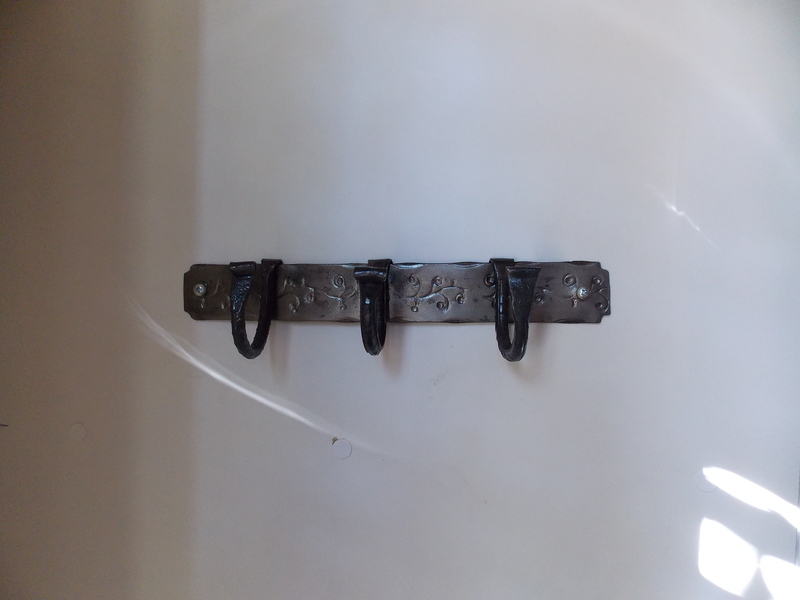 This is a set of hooks I made to our robes on in our bedroom. All the parts are here on the bench waiting to be cleaned up and put in place. So what is It? 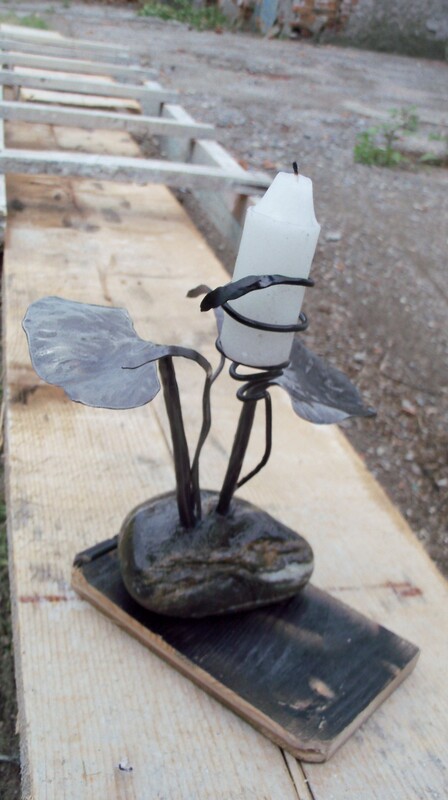 I can have fun making interesting candle holders and the like. Here in Albania we use candle holders more often than than I ever did in the US. That still doesn’t mean I can’t have an interesting holder to look at when it is hanging around. So I am ready to fire up and have something nice to look at. I have a lot of rocks and a lot of ideas for their use. I am going to add a wider base as the rock is just a tad bit to small to catch all the candle wax. No Problem! I can do. Wife liked it too so everyone is happy.